The material on this site is owned by Samuel Penn, and any queries should be directed there. Most of the material on this site is licensed under CC-BY-SA. Glendale is an old website about gaming written by Samuel Penn. It may contain other things as well, but it's mostly related to gaming in some way. By gaming, I mean the tabletop variety - roleplaying games, wargames and sometimes boardgames. I play computer games, but I don't talk about them much (unless I'm writing them). Since some of the content here dates back to 1996 (when the address was on my bifrost domain at Demon), it can vary greatly in style. Most of the content on here is entirely original. Some of it is based on material published by other people - e.g., game content for published RPGs or Wargames. With the coming demise of Google+, which is where most of my public posting has been done for the last eight years, I have created a new site dedicated to blog posts. This can be found at https://blog.notasnark.com/. This site will continue to be used to publish articles and information, but my usual G+ activity will be moved to the new site. For the coming year, I'm hoping to finish at least one Pathfinder Adventure Path, and also to get in some science fiction gaming with Eclipse Phase. On the initial front, I'm going to bring my Roll20 based game of Pathfinder to a pause. I was hoping to get it completed before the Christmas break, but various social events prevented that. There's possibly one, maybe two sessions of that before it comes to a good break point. Pausing that will allow me to take a break from GMing for a bit. Whether we fill that time slot with something else (last time we did some Delta Green) I don't know. For our weekly tabletop session there will be more of our Strange Aeons game. When that pauses, possibly in March, I'll pick up on Rise of the Runelords for the last time, and finish off chapter 6 The Spires of Xin-Shalast. That will be the first adventure path that any of our groups have completed. It's taken about 5 years to get to this point, so it'll be good to reach completion. I've started looking at prepping it now, since there's a chunk of it which is pretty lightly detailed, and I want to flesh it out a bit. After that, I'd like to run some science fiction, and I have Eclipse Phase in mind. I'm currently toying with some adventure ideas, and I've been reading through the 2nd edition rules. Hopefully the new edition will be complete in time for me to run a game based on them. I really like the background to Eclipse Phase, but the rules felt clunky and over complicated (says the Pathfinder player). Possibly this will get done during the Summer. There's been some discussion about what people want to do next in our groups, and I'm tempted to run the Iron Gods adventure path much later in the year. Basically, it's Pathfinder fantasy with robots and laser guns. If it works, it could be a lot of fun. Other than that, we'll be continuing Serpent's Skull during our monthly sessions. That is currently in the fifth chapter, so maybe we'll get to finish that next year. 2018 was a fairly predictable year for us as far as gaming has been concerned, given that most of it seems to have involved Pathfinder. We have had four Pathfinder games on the go over the course of the year, two which I've run and two which I've played in. First, there's been my City of Monuments game on Roll20, which has been a relatively low powered Pathfinder game set in the city of Magnimar. Being city based, the game has been a lot more socially focused, with actions having potential repercussions on how the group are viewed in the city, and sometimes getting into trouble with the law because they can't just kick down doors and investigate in traditional murder-hobo fashion. I also ran the fifth chapter of Rise of the Runelords - Sins of the Saviors. Though this was probably the most dungeon crawl-like of this adventure path, it went quite well, though I learned that getting and painting miniatures for all the creatures is a lot more expensive and time consuming that I'd expected. This path started in 2014, and I'm hoping to finish it next year. At the beginning of the year I tried something different - a one shot adventure set in 1920s Europe using D6 Adventure. The group were a bunch of German (pre-Nazi) secret service agents, tracking down a defecting spy on a very pulp adventure that took them across to Indonesia, with a bit of the supernatural thrown in for good measure. It worked quite well, but the characters seemed a bit overpowered for my tastes, so if I were to run it again, I'd look at either dropping the power level, or upping the opposition. In terms of what I've played, we also tried Delta Green on Roll20. There was far less need for tactical combat maps compared to Pathfinder (no real surprise there), and it worked quite well and was a lot of fun. The GM made heavy use of real places, and allowed us to use Wikipedia and Google Maps to do some research into things (after all, the game was set in the modern day). We ended up on Devil's Tower, dealing with strange other world entities. Much as you'd expect. On the Pathfinder front, there was further continuation of Serpent's Skull and Strange Aeons. The former has been our monthly tabletop game, that has been going on almost as long as Rise of the Runelords. We just completed session 52, and are in the fifth chapter of this. It has a relatively standard party of Ranger, Barbarian, Rogue, Cleric and Wizard. Strange Aeons is the Cthulhu-themed adventure path, which has a different feel to it. My other half is running this, and is a big Cthulhu fan (she also ran the Delta-Green game), so there's a lot more background and detail going on than is probably in the base adventure. This is also an unusual game for us in that we don't have any 'core' characters - I have a Spiritualist, then there's an Inquisitor, a Shaman and an Arcane Archer (probably the most standard character of the group). We did also have a Swashbuckler, but the player for that left to wander the world (seriously). Finally, we also played the 2d20 version of Conan. This is quite good fun, though definitely leans on the heroic side of fantasy rather than gritty. I like some of the mechanics, and we seem to be able to make good use of the momentum rules - my overpowered warrior can generally generate plenty of momentum for the rest of the group to be able to use. This has been a game we've tended to play in between other games, which has given a break from the various adventure paths. So 2018 has been a year of mostly standard games, with a lot of Pathfinder. I'm not a huge fan of the D&D systems, but it's something we all know, and I think it's the best implementation I've played. There's definitely a lot of options available which makes it fresh, but can also make it a bit overwhelming at times. I'm also not sure that adventure paths are meant to take 5 years to complete, or whether that's just because we tend to chop and change between systems and campaigns several times a year. With three regular games ongoing though (one weekly on Roll20, one monthly tabletop, and one weekly tabletop) it's been a relatively full year of gaming. 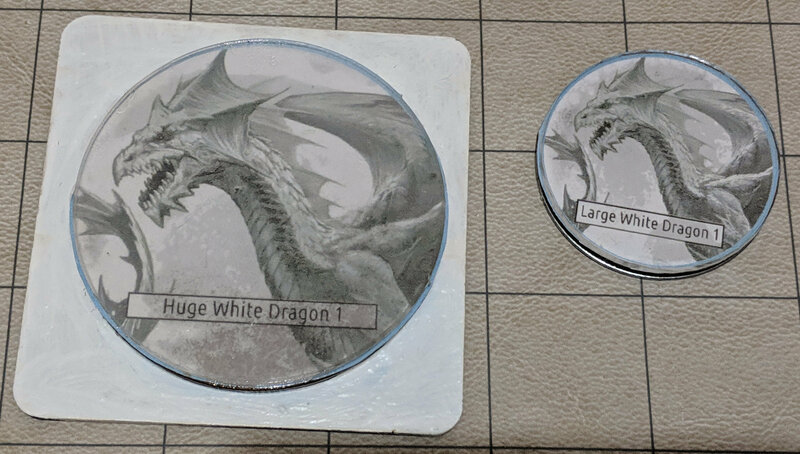 Starting my preparation for the last instalment of Rise of the Runelords, and again taking a different approach to how I represent monsters on the table. For the 5th chapter, I tried to use actual models wherever possible, but that was both expensive (even using plastic Reaper Bones for most of them) and time consuming. This time I'm looking at something both cheaper and quicker. I'm drawing up tokens in Inkscape, and then printing, cutting and gluing to an MDF base of the appropriate size. I then put a clear plastic base on top, to protect the paper image and allow the tokens to be marked with dry wipe pens. One problem I had, was I find round tokens don't work well at large sizes. 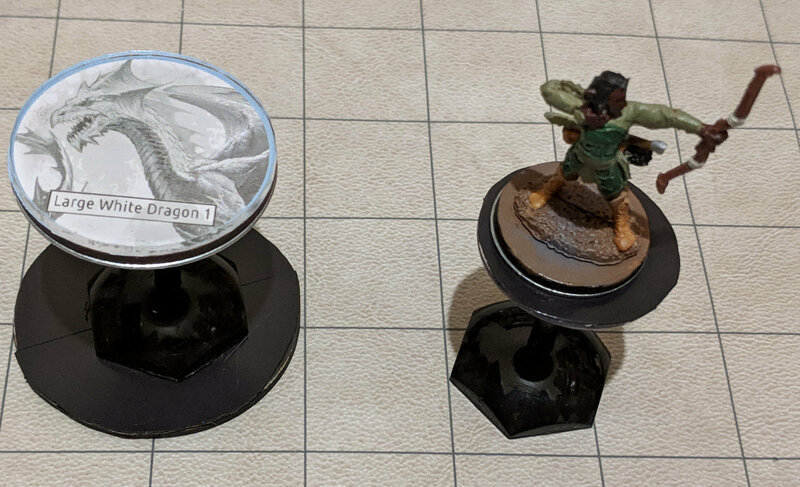 Pathfinder uses square bases for everything, so a round base for a Huge or Gigantic creature makes it non-obvious that the creature also fills the corner squares. Where I source the clear bases from (https://wargamesbuildings.co.uk), don't do square clear plastic bases. 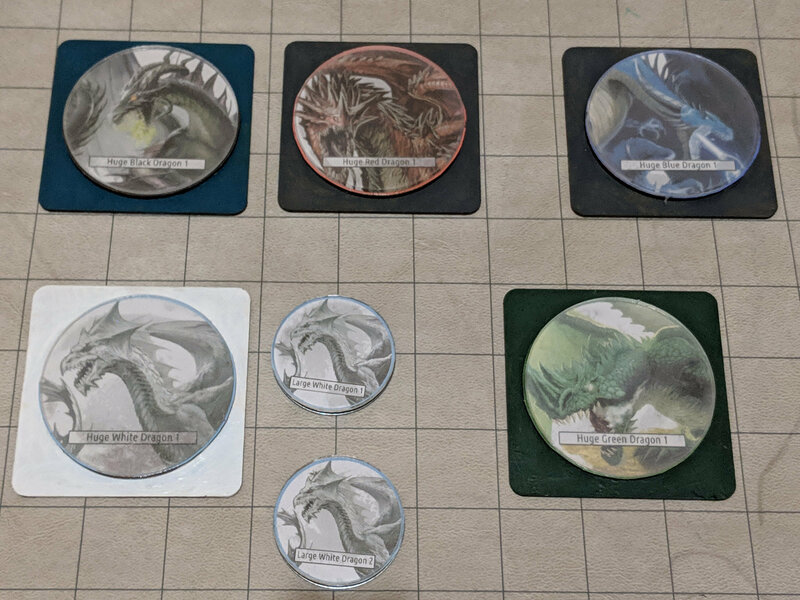 After some thinking, I figured I could do all the tokens as round, then stick them onto a square backing base. This seems to be working fine. I've also done some flight stands, which are constructed from two old Games Workshop flight stands, with a base stuck into each end of the stick. Each stand has magnetic basing material on the top, and a metal base stuck to the bottom. Not only can they be fixed to larger sized bottom bases (to make it clear where a large flying creature is, and for extra stability), but it means they can be stacked without falling over. 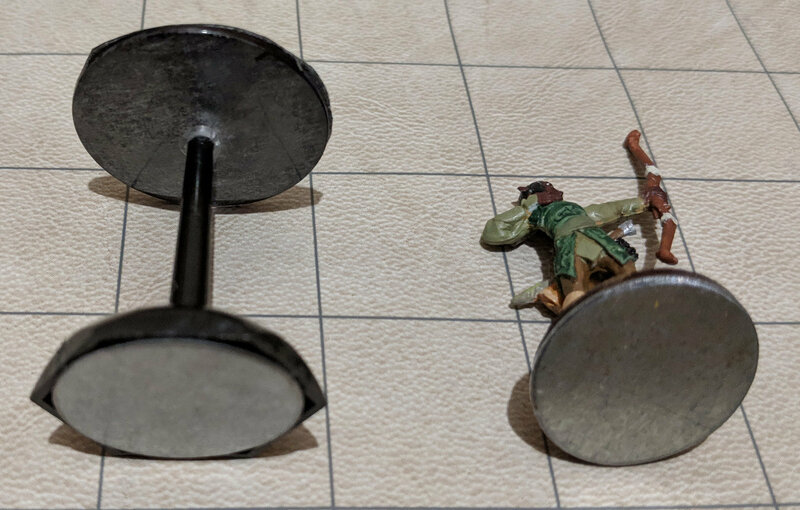 Sticking metal bases on the bottom of character figures or flat tokens means they also don't fall off the flight stands. The metallic basing material can be obtained from the same place as above. I can't remember where I got the metal bases from though. Doing tokens this way also means they take up far less room, and are a lot more durable and portable than actual models. I'll still use some models for the important creatures, but it should greatly simplify everything else. Using the Ultimate Intrigue rules to provide a more tactical approach to social interactions for PCs at a major social event has added an interesting layer to things for my Pathfinder game (see Party Time). However, I've added a couple of extra layers of my own. Firstly, for each phase of the evening, a PC can chose to be seen doing something. This is in parallel to any specific social interactions with NPCs for discovery or influence. It's effectively a short term reputation which may benefit or hinder the PC's interaction with particular NPCs. Each requires a skill check, and success gives a 'bonus' in that sin. The skill DC starts at 6, and goes up by +3 for each point of bonus the PC already has in that sin. These give bonuses or penalties when influencing different NPCs. For example, Gluttony and Envy give a bonus for Lady Sila Crusca (she gets on with people have a good time, but is also interested in malicious gossip). Sloth and Wrath give a penalty for her (unsociable people, or those having loud arguments don't interest her). Some of the activities have a saving throw. Failure can have side effects. Already one PC has failed a Will save for Lust (spend the next phase 'distracted', there is now an untidy bedroom but you've gained a minor favour from some minor NPC). Another has failed Gluttony (caused a mess that servants need to clean up, and a penalty to subsequent saves). Wrath and Envy fails haven't happened yet, so the PCs aren't aware of the repercussions. Succeeding at Sloth also gives a chance to hear some rumours. Finally, another possibly background activity is to spend time nosing around the villa where the party is being held. This has been done just enough to know that they have an option of exploring the Library, the Bedrooms or the Servant quarters. If the PCs opt for taking this further, then they'll find out what happens when they do this.